I recently rediscovered the classic DIY potato stamp. Seeing as it’s almost summer, I’ve been in the mood to think up some fun and easy projects! Every summer, my family goes through fruit like crazy (practically every other season too). After searching high and low for fruit stamps, I was left with no luck. After coming across the potato stamping technique again, I realized it was the perfect alternative, plus much cheaper. I have been loving everything to do with pineapples lately, and made yet another pineapple craft. Along with the pineapple pattern, I added some cute watermelons as well. You could easily take this project to another level, and stamp your own beach towel, tote bag, or even clothing. I decided to stick with basic hand towels, and I absolutely love how they turned out. 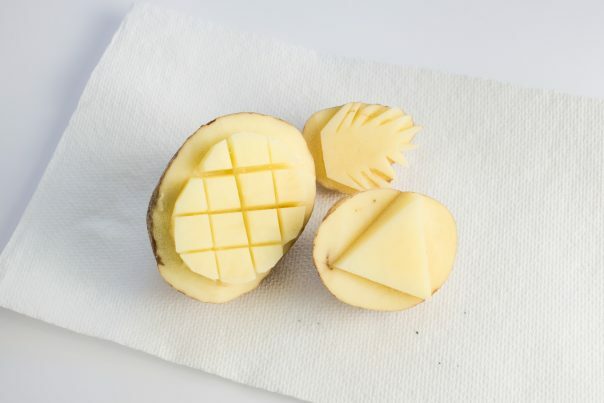 Start out by making your potato stamps. I used two different size potatoes, though by the time I cut down the pineapple enough, it was practically the same size as the watermelon stamp. I tried using a few different tools to mark out the pattern on the potato, but only was able to get a faint line with a gel pen. After figuring out where to cut, I started cutting away. Take your time, and cut in small sections. 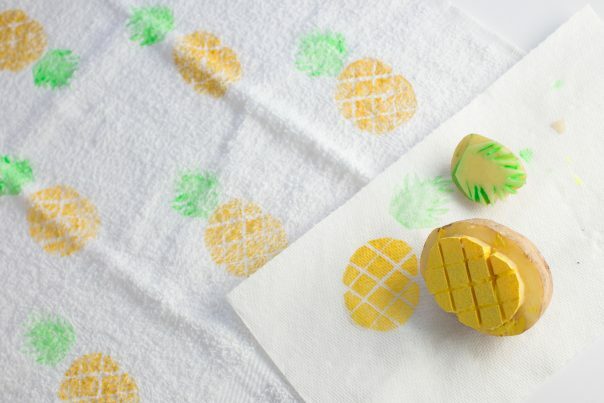 I made the mistake of going too fast for the pineapple stamp, and cut away too much. Here are the stamps after I finished carving. I free handed the pineapple top, since I wasn’t quite sure what I was going for. 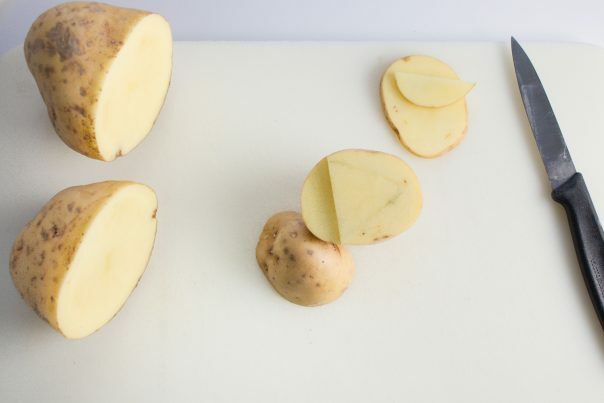 Before you start stamping your project, dab the potato onto a paper towel to soak up the excess water and liquids. Test out your stamps a few times to make sure you have the technique down, and to figure out if you missed any spots that need to be cut away more. I did an alternating pattern for my pineapples, and turned them upside down once I got halfway through the hand towel. 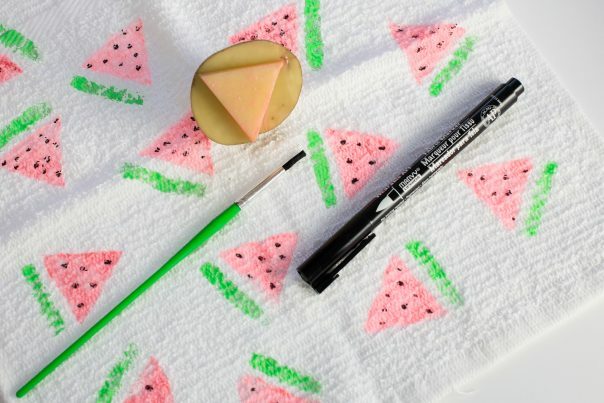 For the watermelons, I used a small paint brush to add the green stripe below the pink triangle. You could easily make up another stamp for this, or if you have the time, add it to the triangle stamp. After it completely dried, I used a black fabric marker to add some seeds to the watermelon. Let your towels dry for another 24 hours, then iron them to seal in the design. There you have it! 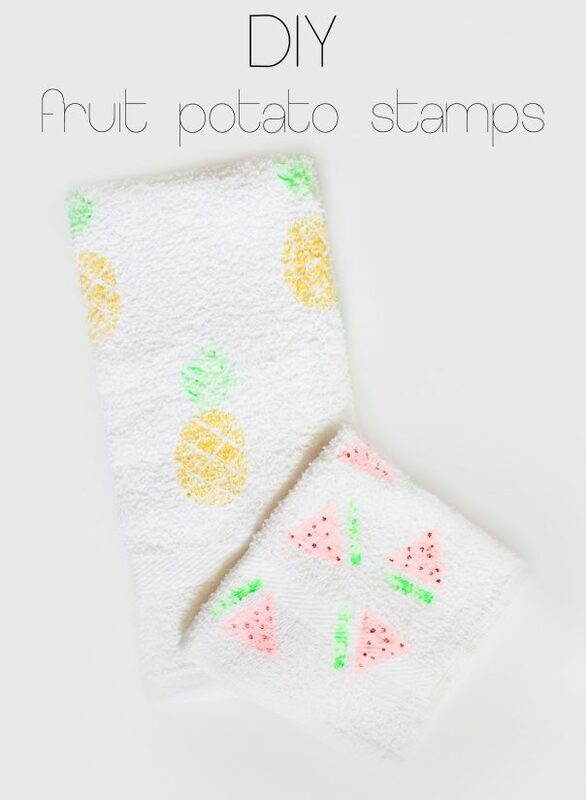 Your own adorable fruit patterned towels!